Meghan Markle and Prince Harry, 33, on Friday attended the Jaguar Land Rover Driving Challenge. The Jaguar Land Rover Driving Challenge was the first sporting event in the 2018 Invictus Games in Sydney. The event was held at the NSW Golf Club on Cockatoo Island, in Sydney Harbour. The Duke and Duchess of Sussex are on their official 16-day autumn tour. During the tour, they are visiting cities in Australia, Fiji, Tonga and New Zealand. The event on Friday was during the fifth day of their royal tour. Meghan arrived at the sporting event wearing a white Altuzarra ‘Acacia’ blazer, costing £1,299. The blazer may be from an upcoming collection as it is not yet available online in white. She teamed the blazer with a pair of black Mother Denim ‘Looker’ skinny jeans, worth £159.65. Under the blazer, Meghan was wearing the official black Invictus Sydney button-up shirt, matching Prince Harry. On her feet, the Duchess wore a pair of ‘Millie’ pumps by Tabitha Simmons, in black. The shoes cost £566.09. 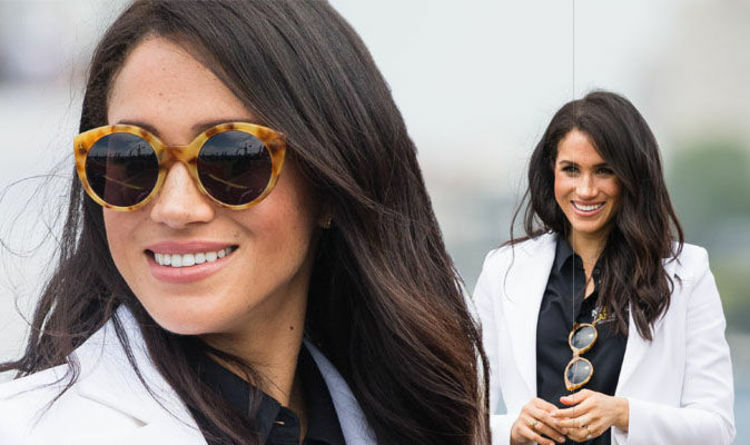 To complete the look Meghan wore ‘Palm Beach’ sunglasses by Illesteva, in amber, worth $240.00. Meghan wore her dark hair down, and kept jewellery to a minimum, with a pair of dainty earrings. The Jaguar Land Rover Driving Challenge decided the first medals of the Sydney Invictus Games 2018. The challenge comprised 24 competitors from 12 nations, competing on their driving skills in Jaguar vehicles. The couple were met by Invictus Games Foundation Chairman Sir Keith Mills and Chief Executive Dominic Reid. Both the Duke and Duchess presented medals after the event on Friday. Prince Harry also tested his driving skills on a children’s driving course with remote control cars. The Invictus Games was created by Prince Harry and first took place in 2014. Competitors include wounded, injured or sick armed services personnel, taking part in sports such as wheelchair basketball and indoor rowing. In 2018, the competition involves 500 competitors from 18 nations, competing in 11 sports.